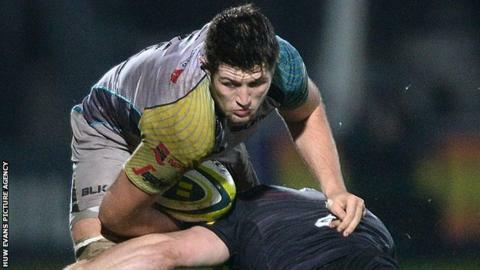 Ospreys second row Rory Thornton has signed his first professional contract with the region. The Wales Under-20 captain, who is currently part of the senior World Cup training squad, has agreed a deal which will keep him at Liberty Stadium until 2018. Thornton, 20, made his senior debut for Ospreys in the LV Cup in November 2014. "Coming through the ranks at the Ospreys, this has always been my first goal," said Thornton. Thornton, who can also play at blindside flanker, played his youth rugby at Bonymaen, the same club as his regional captain, Wales and British and Irish Lions lock Alun Wyn Jones. Thornton made seven appearances in all competitions for Ospreys last season, and is eager for more opportunities in the forthcoming campaign. "Looking back at the last year, it's been really incredible," he added. "This is my home region so I get a buzz from being involved, training with people like Alun Wyn Jones. "Last summer I would have said that I was hoping to train with the senior team and get some LV games but it's been far better than I could have hoped for, playing in the Pro12 semi-final, captaining Wales and everything. "Making my first Pro12 start up in Edinburgh was tough, it showed me how high the required standard is if I'm going to play regularly, but it also gave me a taste and I want to play more for the Ospreys."